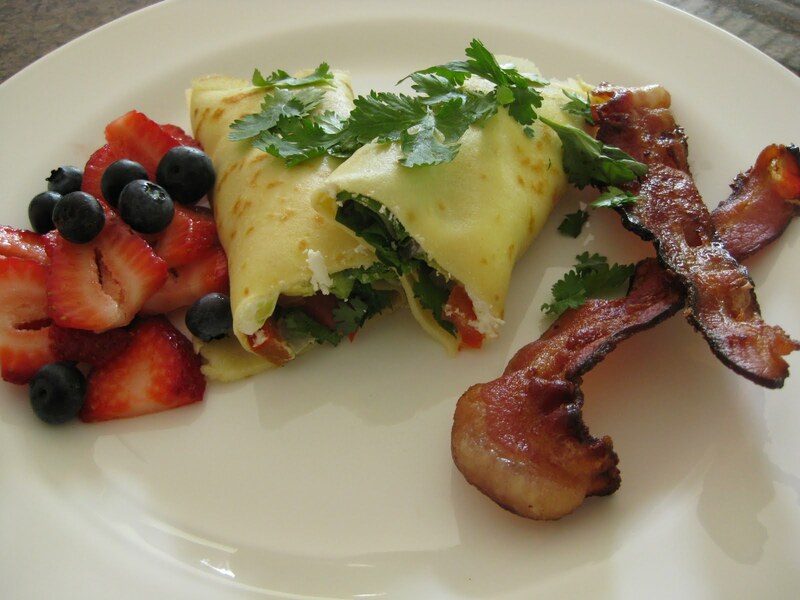 Have you ever had savoury crêpes for breakfast? We have a house guest for a few days and when she came downstairs this morning, she responded to our ‘So what would you like for breakfast?’, with ‘something kind of proteiny and not sugarish’. I offered up savoury crêpes and we agreed we had a deal. I was secretly very thrilled since I had some things I wanted to ‘move along’. And as long as the ingredients are still fresh, the dish is prepared with love and presented nicely, we all come out smelling like roses! My ‘move it along’ list included: goat cheese, red pepper, red onion, cilantro, avocado. I sautéed the red pepper and red onion together. TIP ABOUT BACON: We decided to have bacon on the side since I had some on hand in anticipation of company. I love to cook up my bacon right away and store it in the freezer. That way the thought of mess doesn’t interfere with the pleasure of making a dish that calls for bacon. Especially if the required bacon is just a small amount. And I usually under cook it a bit so that it presents well after reheating. We did have leftover bacon this morning and it is now freezer bound. I was given this recipe by a crêpe aficionado, who experiences these thin pancakes as a staple in her home on many weekend mornings. Although it is unconventional in its pre-pan preparation, the idea of using the Vita-Mix to pull it all together means that it is all so effortless and maybe even less messy. For those that are crêpe construction die-hards doing it the ‘right way’, the proper technique is that the eggs are whisked into the flour first to ensure no lumps, and then the milk is whisked in to the appropriate consistency that any authentic French crêpe maker seems to know by look and feel. I continue to stick to my short cut approach. 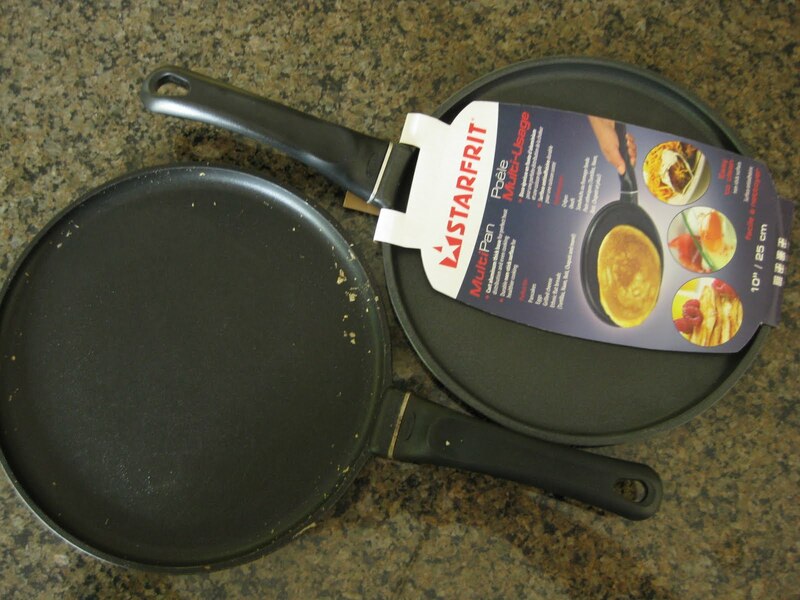 I have a 10″ Starfrit crêpe pan acquired from Costco many years ago for dirt. I have seen them lately at the Great Canadian Superstore in their kitchen section for $19.99. In fact, my husband doesn’t know it, but I have one stashed away for gifting that could easily get gifted to me if I feel so inclined to need two on the go at once. Getting the pan to the right temperature is key to a successful crêpe and that just takes experience to get the feel for your pan. I have a handy 1/4 cup ladle that works well for moving the crêpe batter to the pan very quickly. Once all the crêpes were cooked, we began assembly. It works well to lay down a 1 1/2″ track of the goat cheese across the middle of the crêpe first. I then layered on the thin avocado slices, the onions and red pepper and finally a good shingling of cilantro leaves. Roots and Shoots Farm’s cilantro, I might add! How many crêpes you choose to have depends totally on your morning appetite. Along with a tall latte, it was a pretty good way to start Bastille Day. Did you celebrate the day? What would you have for breakfast if you wanted ‘something kind of proteiny and not sugarish’? Thin French pancakes, the well-known crêpes, are custom-made to fill with savouries or sweets. Keep a batch handy in the freezer so you can spread them thinly with raspberry jam, fold them over a scoop of ice cream, drizzle them with chocolate sauce – and call them dessert. In bowl, whisk flour with salt. In small bowl, whisk together eggs, milk and 2 tablespoon of the melted butter; whisk into flour mixture until smooth. Cover and refrigerate for 1 hour. Strain into another bowl. Heat crêpe pan over medium heat. Brush lightly with some of the remaining butter. Pour 1/4 cup batter into centre of pan, swirling pan to coat; cook for about 1 minute or until bottom is golden. Turn and cook for 30 seconds. Transfer to plate. Repeat with remaining batter and butter. Make-ahead: Stack crêpes between waxed paper, wrap and refrigerate for up to 3 days or freeze in airtight container for up to 1 month. Makes 8 crêpes.